If you are still stuck on "I can not update my PS3 via pen drive?" then you have arrived at the right place. There are lots of PSx [especially PlayStation 3] gamers are facing the problem while they are going for official/custom firmware update [OFM/CFM]. Learn more about Ps3 no applicable data found & the fix for the hard drive upgrade software update install. I've seen that many users having a difficulty trying to update their PS3 with a Flash drive but come across this frustrating error "No applicable update data was found. Connect storage media that contains update data of version 4.10 or later, and then press the START and SELECT buttons at the same time." Your PS3 keeps going onto its black screen & showing "No Applicable Update Data Was Found" Initially I thought it is related to Hard Drive upgrade problem as you can not update your PS3 via pen drive if there are not proper settings shown below. 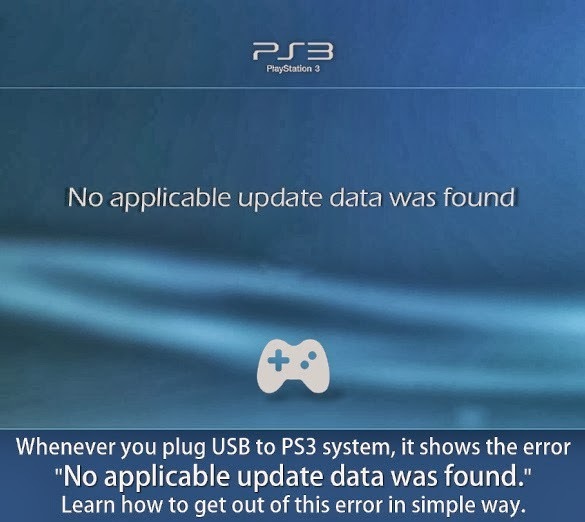 Whenever they plug PS3 storage media like USB pen drive to PS3 system, it shows an error saying "Applicable Update Data Not Found" or "Connect storage media that contains update data of version." There is no issue neither with your PS3 storage media [memory stick PS3 ] nor sony software. Learn how to get out of this error in a simple way occurred to update PS3 software or to download PlayStation firmware. In previous post we have learn how to solve the error "Unfortunately, Touchwiz home has stopped" coming on Android OS. And today we are going to see how to solve hard drive upgrade problem in sony system. Lots of guys tried all the possible ways that they could do and then they were sure that they had it saved correctly. Initially, they even saved PlayStation update system software [Latest PS3 firmware] to SD card and tried with adapter, then on DVD-R or DVD-RW, but still no luck. Then they swapped out an HDD from an old YOLD 40GB, still no luck, they played around with formatting and installing update system software for hours. Then got referred from Sony PC support website and had an FAT CECH M03 YOLD (love to Sony) HDD which had a lot of data on it, so they were reluctant to put it in PS3 SLIM as it would instantly format it and probably gives another error message "Can't find HDD..." etc etc. Moreover, some of them are also tried with SAFE MODE. And at the end, it keeps getting no applicable data found and they seem to ask again "why my upgraded PlayStation 3 hard drive is still NOT working???" It doesn't require that much of efforts to have new firmware PlayStation if this error can be solved by some easy steps. Learn how to get out of this error. Before starting one thing I want to describe you that the newest sony software especially comes for PlayStation update or PSx firmware update is CASE sensetive. Sony PC support described that the update file should be put as it is at the exact folder in PS3 storage media. The USB drive must be formatted to FAT32 with default allocation unit. In the root directory of the drive you need to have a folder named "PS3"
In that "/PS3/" folder you need to have a sub-folder named "UPDATE"
In that "/PS3/UPDATE/" sub-folder you need a file named "PS3UPDAT.PUP"